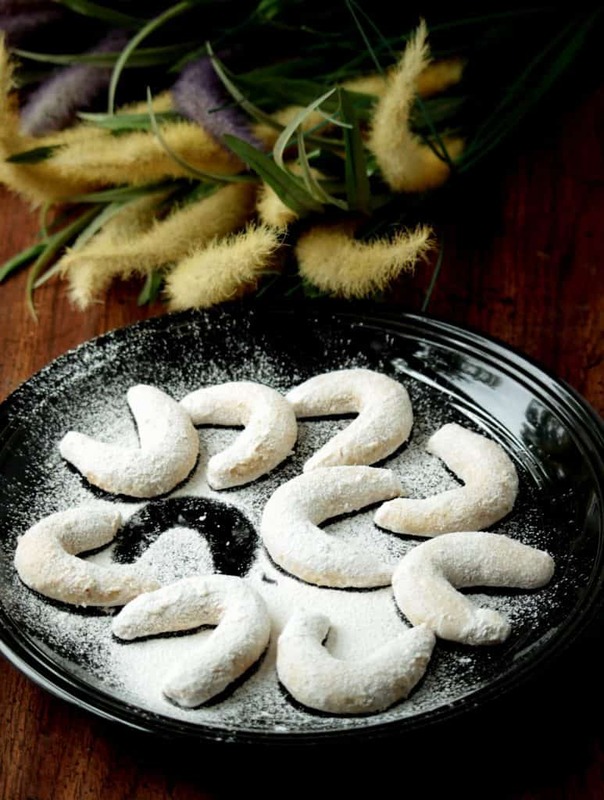 Vanillakipferl originated from Vienna in Austria and is a very famous cookie during Christmas. 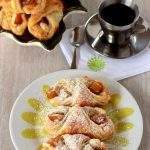 These cookies are very popular throughout Europe and can be found in every coffee shop. 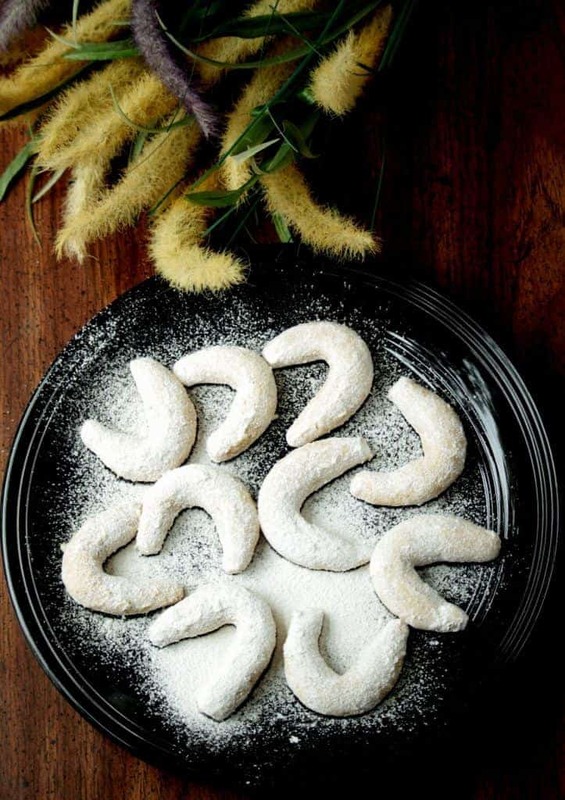 Vanillakipferl cookies are shaped in the shape of crescent moon symbolizing the victory of Hungarian army over the Turkish in one of the many wars. 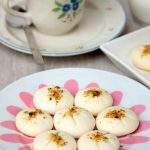 These cookies are also widely baked in Germany, Hungary, Romania, Poland, Czech Republic and Slovakia during Christmas. The cookie dough usually has walnuts in it, but it is common to find it with almonds as well. I made the cookies with almond meal and I have to admit that I have used the almond meal quite a bit this month and have fallen deeply in love with it. 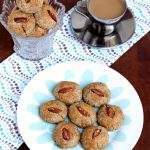 The nutty flavor it imparts to the cookies is just amazing without overwhelming. The cookie dough has egg yolk in it , but I skipped the egg and used a little bit more milk. The cookies are very delicate when they come out of the oven. Handle them a little carefully. 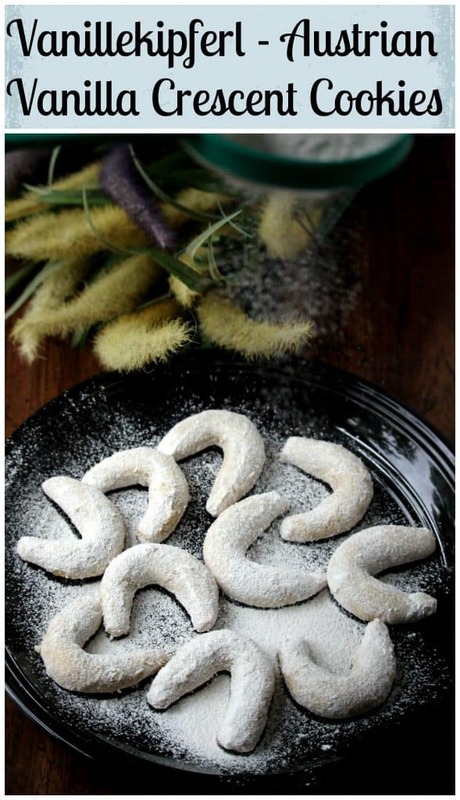 Also coat them with the powdered sugar right when the cookies are warm as they stick better. 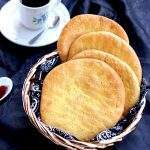 Vanilla sugar makes a big difference in the flavor of the cookies. In Europe, the vanilla sugar is easy to find in the stores, but I have never heard of them in US before. So I adapted the recipe to make the vanilla sugar and followed it. I have to say the vanilla sugar is pretty addictive. 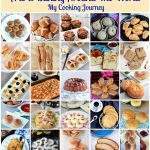 I would be making a batch of it when I am done with all my baking for this month to use in other recipes. I made the vanilla sugar using powdered sugar and vanilla extract. In a bowl, measure the powdered sugar and then add the vanilla extract to it. 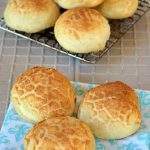 Mix well using a spoon and you will see that it is resemble a wet tight dough. At this stage, you could either let it air dry for one whole day or quickly dry it in a mildly warm oven. If air drying the sugar, you will notice that after a day, the sugar mixture would be solidified. break it into small pieces and then run it is spice grinder to break it down. Then use a fine sieve to sieve the powder. The vanilla sugar is ready. Store it in an air tight container and use as needed. 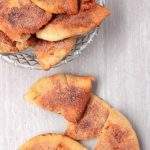 To dry the vanilla sugar in a shorter period, preheat the oven to 150 F and then turn it off. Leave the vanilla sugar in this slightly warm oven for about 2 hours and mine had dried up pretty much. 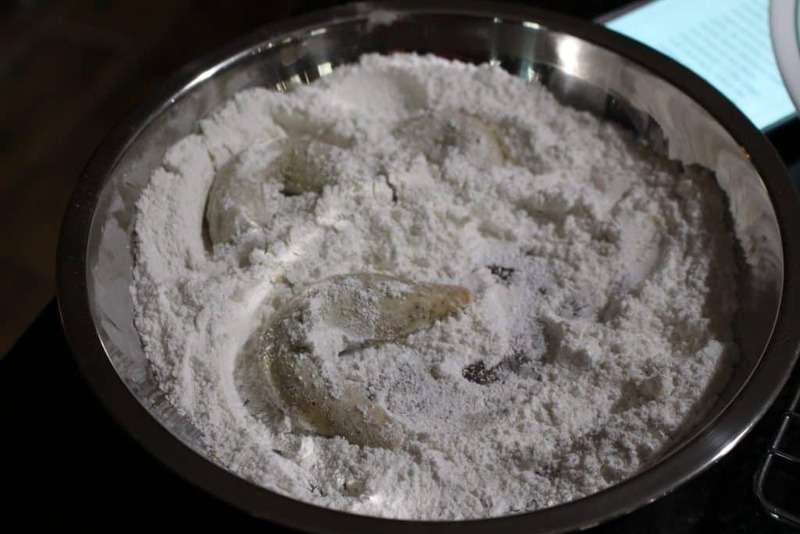 I then let it sit in room temperature for about an hour and then pushed it through a fine mesh sieve to make it into a fine powder. I used the back of my spoon against the sieve to crush it better. I made my dough in the food processor. measure the flour and add it to the bowl of the processor. Add the chilled and cubed butter along with the flour and pulse it a few times to break down the butter. 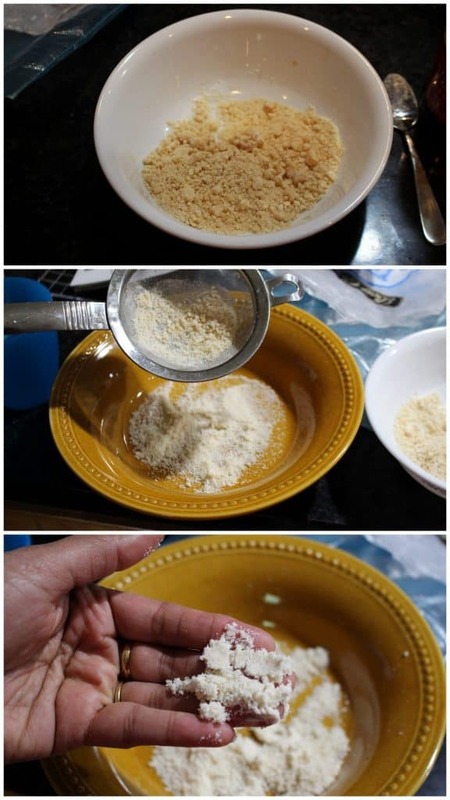 Once the butter has incorporated with the flour, you will notice that it looks like bread crumbs. At this stage, add the almond meal, vanilla extract, powdered sugar and a pinch of salt to the bowl. Add about a tablespoon of milk and process the mixture until they come together. If the mixture appears too dry add a little more milk to form a tight dough. Make sure you pulse it in small interval. We don’t want to heat the dough. Remove the dough from the food processor and place it in a bowl. Knead it a few times and then divide it into 4 parts. Roll each part into a thin long rope, about 1/2 inch in diameter. Cut the dough into even pieces about 2 inches long. Roll each pieces to form a thin rope about 3 1/2 inches long. When rolling try to make the edges slightly thinner. Do not make it too thin as it will bake quickly than the rest of the cookie and will become too dark. 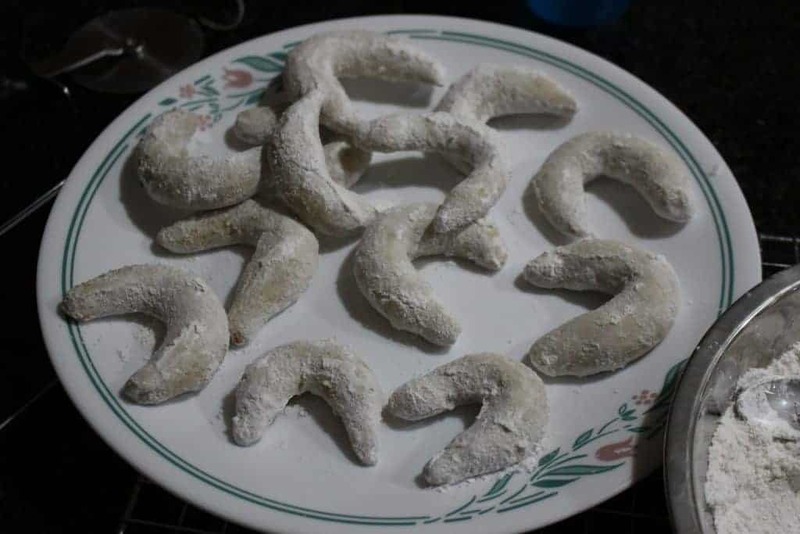 Form the rope into a crescent shape and place it on a parchment line baking sheet leaving about 1/2 inch space between cookies. Repeat the same with the rest of the pieces. 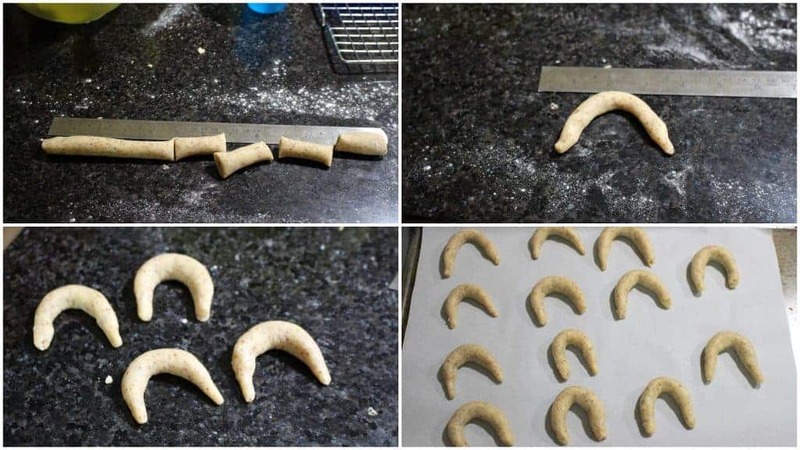 Bake the shaped cookies for 12 to 15 minutes. Make sure that the cookies develop a light color and do not darken too much. 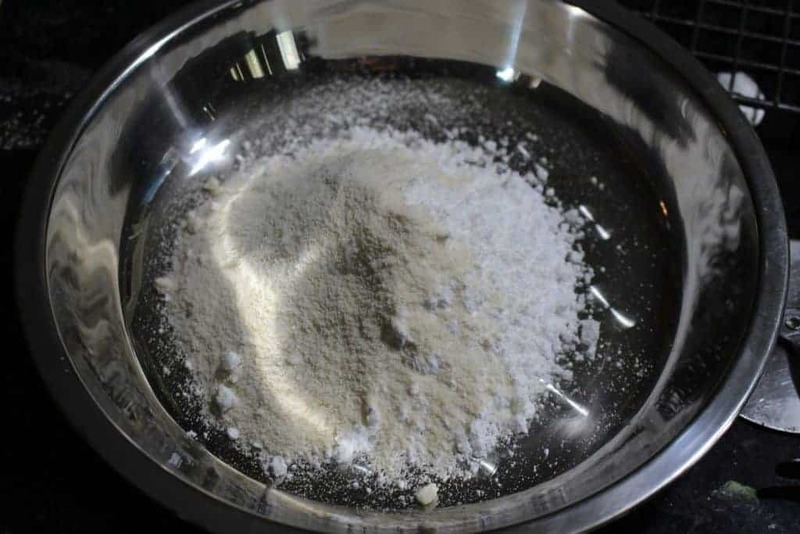 When the cookies are baking, place 1/2 cup of powdered sugar in a wide bowl. Add 3 tbsp of vanilla sugar to the powdered sugar and mix it well. This will be mixture to coat the baked cookies. Once the cookies come out of the oven, carefully remove it on a cooling rack. Let it cool for about a minute and then immediately transfer the cookies to the sugar mixture. Coat the cookies well and then place them on a plate. The cookies coat well when they are still warm. Repeat the same with the rest of the cookies and let it cool down well. Once the cookies cool down well, store them in an airtight container. Coat with more sugar if needed. It is amazing to see the impact of war on food. Beautiful pick for V. The cookies look tempting and delicious. Looks like we picked both the same cookies for V, we enjoyed thoroughly this cookies. 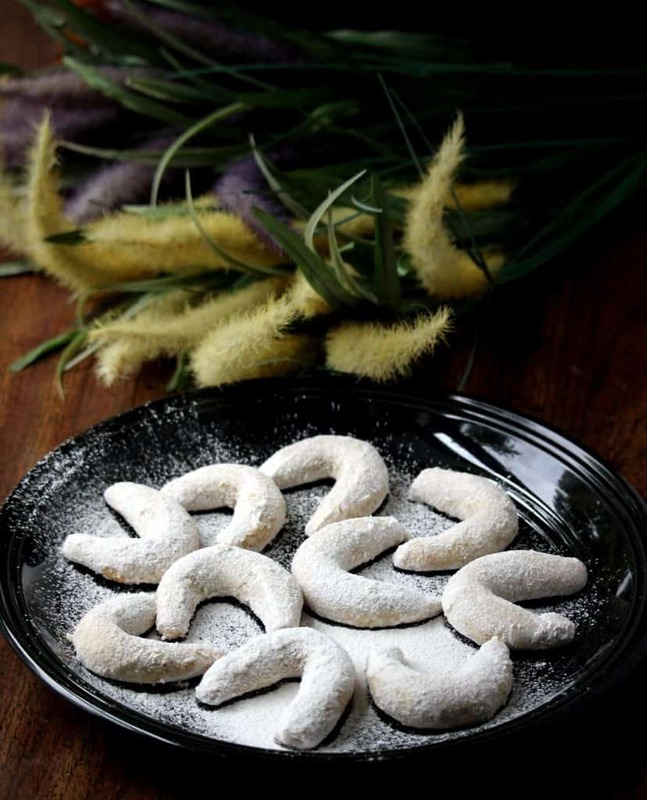 These cookies look so soft and delicate , love the way they are dusted with sugar . 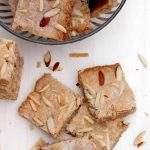 Vanilla sugar is very common in U.K. And I got loads from there , now with this recipe on hand will use it . he he let me about vanilla sugar. Apadiye sapiduven. 😉 😉 Awesome pick for V and these have turned out really well. Seems like this is one popular pick for V.
Vanilla sugar sounds interesting. These cookies looks amazing and sinful too. 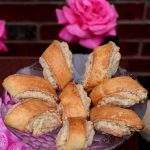 Love the crescent shape of the cookies. 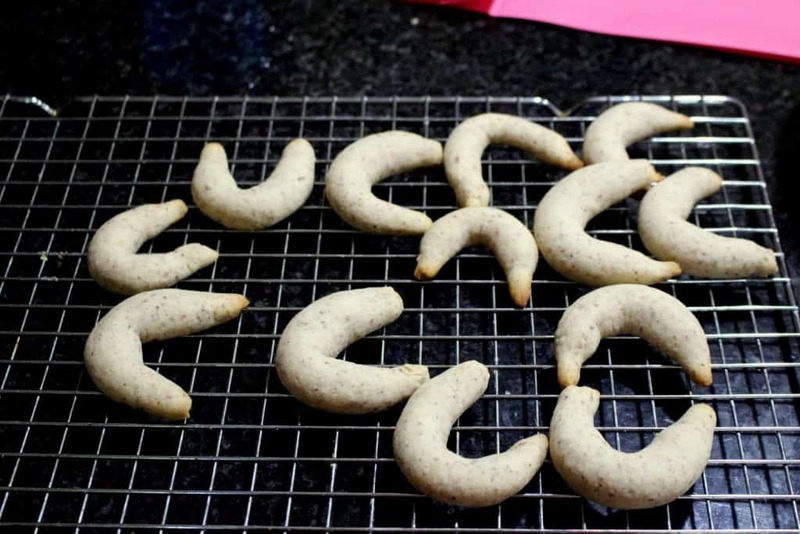 The crescent shaped cookies looks absolutely delicious. These look picture perfect. 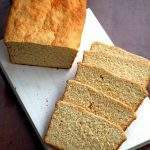 Great shape and I agree on the taste of almond meal, it imparts a unique scrumptious flavor. Those cookies like they melt in the mouth. Lovely clicks. Pretty cookies.. The crescent shape has come out perfect!! We make these in Sweden too, but no walnuts just vanilla in them.